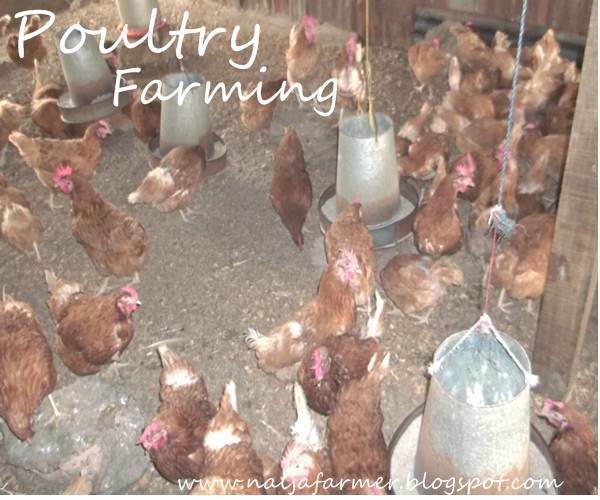 Poultry Farming in Nigeria is one of the most profitable agribusinesses in the Nigerian agriculture sector. It is a lucrative money making venture in Nigeria. within a short time frame, due to the fact that chickens mature very quickly. In Nigeria, poultry farming in Nigeria is experiencing significant growth due to the fact that an increasing number of people are moving away from the consumption of imported frozen poultry products, which is usually not too good for health. As a result, there is an increased demand for local poultry products like chicken, turkey, eggs. This is great news as it creates business opportunities in Nigeria. I always encourage young school leavers and graduates to venture into agribusiness especially poultry farming as a means of employment and income. The demand for poultry is high and rising every day due to Nigeria’s emerging economy, and the measured increase in the standard of living. A poultry farmer will not find it difficult selling off his or her products. This is as a result of a rise in the number of hotels, restaurants, bars, social events and public holidays that are celebrated and even individual families buying poultry products. Poultry farming can be started on a small scale, and the space you have available will determine the number of chickens that you can farm. To increase your profits, you should take advantage of all products and by-products from the farming. For instance, poultry droppings can be sold as organic fertilizers to farmers and used as another income source to secure the future of your venture. Poultry birds includes all the birds that can be kept for either meat or eggs. Poultry birds like Chicken, turkey, quail, guinea fowl,ducks, are reared in Nigeria. In Nigeria, Poultry farming is always seen as Chicken farming. There are 3 basic types of chickens – broilers, cockerels and layers. Broilers is fast growing chicken, farmed for meat production. Cockerels are also reared for meat production although they're not fast growing. Layer hens are reared for egg production. As a new farmer, I would recommend that you choose, and specialize in one breed to begin your farm. Once you have gained the knowledge of how to produce that breed very well, you may consider adding other types to the farm. Note that broilers require around 8 weeks to grow to table size from day old chick while cockerels require 6 months, and layers need a minimum of 19 weeks in order to begin laying eggs. This should guide you in making your choice. Depending on your budget,you can either rent or buy a land. When you acquire the land, you fence it to prevent thieves and unwanted persons from entering into your farm and stealing your birds. There are important points to note when building your poultry house. 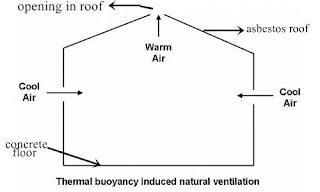 The main feature of a poultry house is a cross ventilation system. 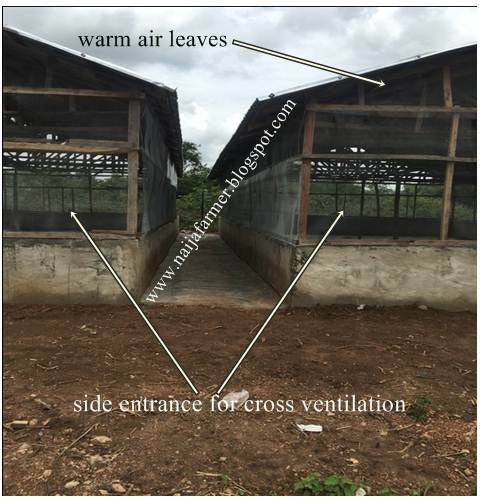 The cross ventilation system helps circulate gases in the poultry house and prevent respiratory problems for the birds. It also helps to regulate temperature in the poultry house since it allows warm air to leave and cool air to come in. The second feature is building the poultry house in the east-west orientation. The east west orientation conforms to the rising and setting of the sun in the East and West respectively. Building with this orientation helps protect the poultry house from heating up as a result of sunshine. The building design and position of the poultry house will determine the success or failure of your poultry farming venture. 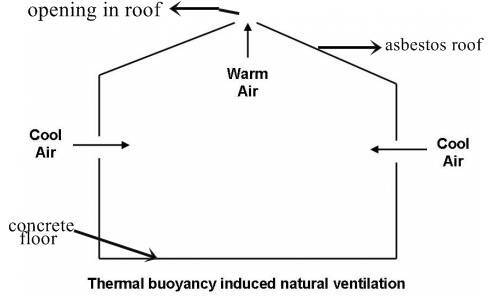 Temperature, which is controlled by the ventilation will determine your poultry growth and feed conversion. If temperatures are too high, poultry will be stressed and will not eat as much as they could, or may not eat at all. If they don’t eat, they don’t maximize their growth potential. You can hire my service to consult for the design and building of your poultry houses. Remember a poultry house design and building is not what you do carelessly. You need a professional like me. This is also where your success or failure in chicken farming lies. poor farm management, causes the failure of poultry farming venture. Effective management of of the poultry house and birds, such as changing the food or water when contaminated with faeces can lower the risk of disease. Spillage of water on the beddings should be prevented at all cost. Coccidiosis, a deadly disease in poultry ios caused by wet litter beddings. In case of spillage of water clean the wet area and replace with dry beddings(wood shavings). Also change the beddings regularly so that your poultry house would be hygienic and conducive for your birds. Chicken feeding is another very important factor that will determine your success in poultry farming. You should make sure balanced feed is fed to your chickens. Feeding your chickens a complete and nutritious diet is essential if they are to stay healthy and lay lots of profitable eggs! Avoid buying substandard or adulterated feeds. Do not cut corners when it comes to feeding. When you feed your chicken and poultry birds quality feed and in the right time they will give you results and more income. If your are venturing on a large scale, I would suggest you produce your own feeds to make sure you are feeding your birds with quality feeds. Determine whom your buyers would be. Who are you planning to sell to. Market research helps you find out the best way to sell your products and make more profits. Many poultry farmers target the festive period like Christmas, Easter, New year, and so on. For example, you can stock broilers at October-end if you want to target Christmas and have them ready for sale by the 3rd week of December. Your target market will determine when to harvest or sell. If you select layer hen farming for egg production you will have a year-round market, as layers need over 52 weeks for the completion of the laying cycle. Once you have settled on your location, you need to invest your capital. The bigger your project, the larger the investment required. • Small scale – You will need around ₦70, 000 to begin rearing chicken on small scale (around 50 birds) and keeping them in cages at your residence backyard. • Medium scale – You need about ₦500, 000 – ₦5 million to start a mid-scale poultry farm, which needs housing and other materials over land spreading 1-2 plots. • Large scale – Around ₦10 million is needed for this type of intensive project. This will involve many birds ranging to many hundreds, a high degree of planning, use of equipment, professionalism and the use of advanced poultry farming techniques. You should always look for healthy day old chicks from a good hatchery. The cost can vary from ₦140 to N200. In some cases, it can be even up to ₦300. Do your research, and know what you’re looking for. Chickens reared for the meat(broilers) can be slaughtered at 6 to 8 weeks old and are considered “fully grown” as they are fed a high protein diet. Cockerels mature to table size in about 22weeks while layers poulets will drop first egg in about 19months. You can begin making an income within only 6 months of setting up your own poultry farm. On the basis of this calculation, you can double your returns in a year. You can sell a healthy, full-grown chicken in Nigeria for 2,000 – 4,500 naira depending on the size and weight. If your farm yields 1,000 chickens, you can make a minimum of 2 million naira by the time you have completely sold them. You can also make money by selling the eggs of the layers. A single crate of small eggs sells at anywhere between ₦700 and ₦850 while one with bigger eggs sells at ₦800 – ₦1000. Typically, each crate holds 30 eggs and when you have 500 layers producing 12,000 eggs in 1 month, you can make ₦200, 000 – ₦260, 000 every month if you decide to sell all. Price is also not steady, and fluctuates as a result of recession. Poultry farming in Nigeria is very profitable, and many Nigerians and foreign investors are already making a lot of money from it. Considering the fact that this country is highly populated, you can easily understand why your poultry farming business has the potential of becoming successful. You can start with 100-1,000 birds and move your way up, or only start with a few you can manage and grow gradually. If you business and marketing knowledge, you will have an advantage, and be able to establish your business within the local and national poultry farming industry. Poultry farming in Nigeria is a booming industry, start immediately! For Questions and suggestions please use the comment box...... And don't for get to share using the share buttons below.